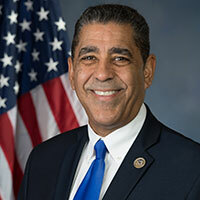 First elected to Congress in 2016, Rep. Adriano Espaillat (NY-13) serves as a member of the influential U.S. House Foreign Affairs Committee, the House Committee on Education and the Workforce, and the House Select Committee on Small Business. He is a member of the Congressional Hispanic Caucus (CHC) and serves in a leadership role as CHC Freshman Representative to the Democratic Caucus. He is chairman of the CHC Task Force for Transportation, Infrastructure and Housing. Rep. Espaillat’s congressional district includes Harlem, East Harlem, northern Manhattan and the north-west Bronx. Throughout the tenure of his career in public service, Rep. Espaillat has been a vocal advocate for protecting tenants, improving schools, and making serious, smart investments in economic development, job creation, and environmental protection. Prior to coming to Congress, he served as a New York State Senator during which he represented the neighborhoods of Marble Hill, Inwood, Washington Heights, Hamilton Heights, West Harlem, the Upper West Side, Hell’s Kitchen, Clinton, and Chelsea. While in the New York State Senate, Rep. Espaillat served as the Ranking Member of the Senate Housing, Construction, and Community Development Committee; Chairman of the Senate Puerto Rican/Latino Caucus; and as a member of the Environmental Conservation, Economic Development, Codes, Insurance, and Judiciary committees. Prior to his tenure as a state senator, he served in the New York State Assembly, and in 1996 became the first Dominican-American elected to a state legislature. In 2002, Espaillat was elected chair of the New York State Black, Puerto Rican, Hispanic and Asian Legislative Caucus. To find out more about Rep. Adriano Espaillat and to follow his work in New York and Washington, visit online at https://espaillat.house.gov/ and follow him on Twitter and Facebook.